Drawing is an interrogation, a way of concentrating, or meditating, of allowing thoughts to rise slowly. It can be an attempt to understand not only physical structure but also something of the psychological structure and one’s own responses to the subject. These recent monoprints are developments from sketches and are responses to human inhabited places and spaces. Some were done on site during a journey in the Far East, part of a virtual residency with HATCH. 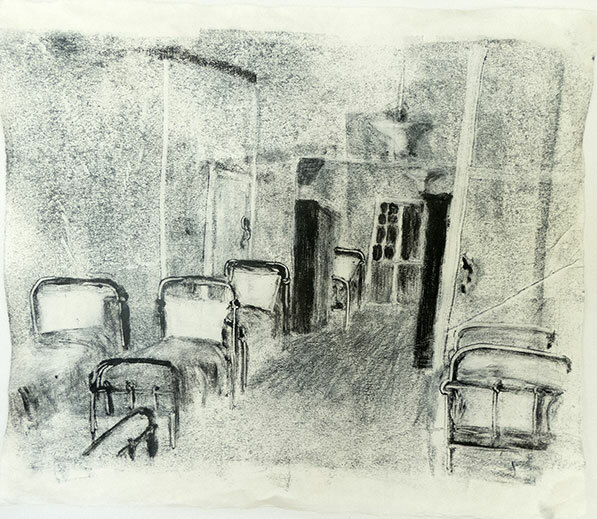 Some are from old photographs of the Bristol Mental Hospital, at Glenside Hospital Museum where I have spent time as artist in residence.